$3,162 Login For Price!PRICED TOO LOW TO ADVERTISE!!! 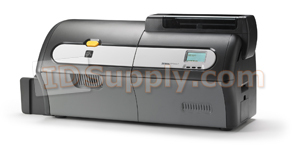 The Zebra ZXP Series 7 features full single sided printing. Using the latest in Zebra® card-printing technology, the ZXP Series 7™ printer provides high-volume high-quality card printing. The ZXP 7 offers a 200 card input hopper and high capacity ribbons. The printer delivers fast yet reliable performance while offering users exceptional value by lowering the printer’s total cost of ownership. Time after time, it prints sharp vivid cards with precise color control. Choose from numerous encoding and connectivity options, and if you need extra security or durability for cards, efficient single- or dual-sided lamination is also available. Locking mechanisms protect the printer and media, and software provides further security by tracking and restricting activities as required. Includes a Zebra Two Year Warranty. The ZXP Series 7 printer features fast print speeds that improve productivity and reduces wait time. The ZXP Series 7 printer is able to process up to three concurrent print jobs by encoding, printing, and laminating simultaneously. In addition, Zebra True Colors ix Series ribbons are specially formulated for high speed printing. The Zebra ZXP Series 7 ID card printer is faster than most comparable printers on the market which averages 300 full color prints (single sided) per hour. Contactless/Contact Encoder: Combined MIFARE® ISO 14443 (13.56 MHz) and ISO 7816 contact encoder. The ZXP Series 7 printer is designed to work with Zebra True Colours ix Series ribbons and Zebra True Secure i Series laminate. The high-capacity ribbons reduce costs by delivering more images per roll and feature an improved formulation for printing high-quality images at higher speeds. Many ribbon types are available in two sizes to meet the needs of every printing task. Zebra True Secure laminates reduce the risk of counterfeiting and extend the life of your high-security cards. The unique laminate design dramatically reduces waste by eliminating the need for carrier material, backings and liners. Specially designed cartridges make laminate replacement simple. Both the ribbons and laminates utilize intelligent media technology, which automatically detects and calibrates the printer. You can get all the latest Zebra ZXP Series 7 drivers and firmware from Zebra’s website. NOTE: For optimum print quality and printer performance, use genuine Zebra™ supplies.